The EU referendum is currently dominating our news channels, newsfeeds and nightly dinner table discussions, but what about the social media tactics and platforms used by both campaigns to try and sway us to their side? What follows is a breakdown of their social campaign strategies by platform choice and campaign highlights, with a round-up of key takeaways to finish. 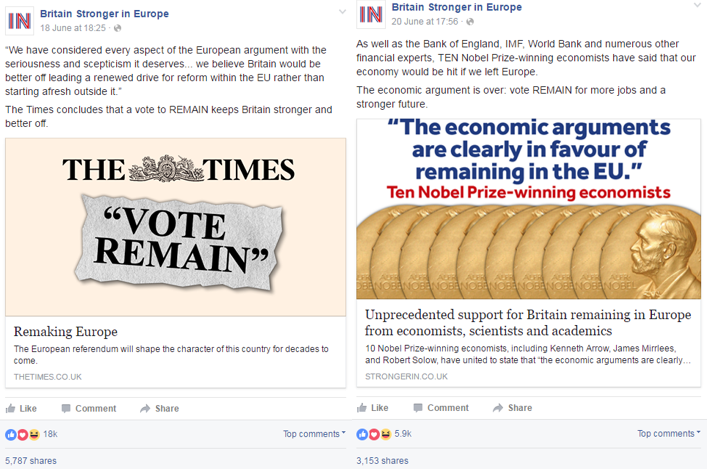 The Vote Leave campaign have a strong Facebook presence. With over 750k likes, they also consistently receive over 4k likes per post – demonstrating a minimum consistent base engagement rate of over 5% (Social Bakers benchmark for pages of this size stands at around 0.13%). 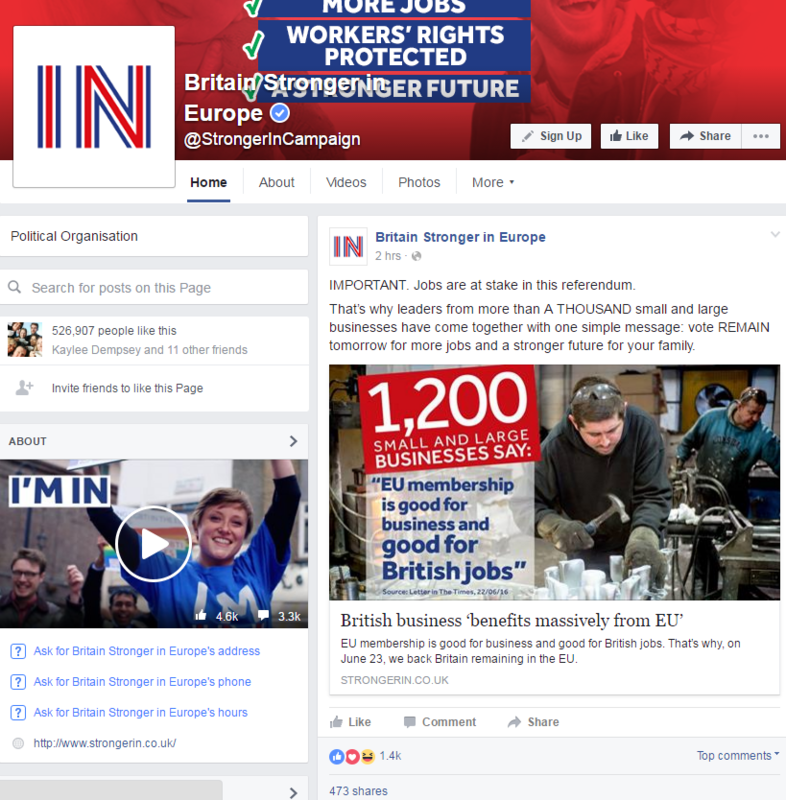 The Stronger In campaign are also very active on Facebook. Whilst they have a smaller audience at just over 525k likes, they receive a higher engagement rate than Vote Leave. This may be because users are less willing to publicly associate themselves with Vote Leave posts due to negative connotations, whereas Vote Remain seems to be the more popular, socially accepted view. Both campaigns are currently posting fervently. However, more active doesn’t always mean more effective. 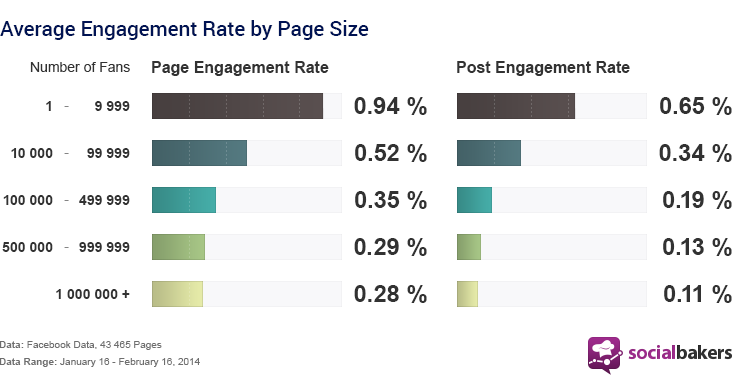 The Facebook algorithm works best when you post between 5-7 times per week. Anything above this is likely to result in Facebook dropping your organic reach, leaving paid posts as the only avenue to reach your audience. In this case, budget doesn’t seem to be an issue, however, both still run the risk of spamming the newsfeed until users tire of the saturation and unfollow. I’m a strong believer in judging a person by their Twitter bio, so here is Vote Leave’s offering: “A cross-party campaign advocating a vote to leave the European Union on 23 June. 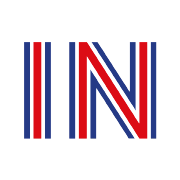 #LeaveEU.” A strong effort - simple, to the point, non-offensive, with inclusion of a campaign hashtag. Overall, they perform well on Twitter - with around 65k followers and regularly receiving over 100 retweets per tweet, which is strong by any standards. Interestingly, the Stronger In campaign have chosen to promote their campaign on Instagram, whereas Vote Leave are notably absent. This is very telling of the nature of each campaign. Stronger In is more emotive, optimistic and inspiration-based, so more suited to Instagram, whereas the Vote Leave campaign is based more heavily around statistics. The Leave.EU campaign spotted that Brexit could be an opportunity for the often-overlooked platform, LinkedIn, to play a role in striking a chord with top company influencers who may not be active on platforms such as Facebook, Twitter and Instagram. However, as their organic updates were sporadic, they didn’t receive much traction, and without paid advertising their efforts wouldn’t have had a notable impact. According to The Independent, last month the Vote Leave campaign was around 45% more active on social than Remain, tweeting 1,216 times and posting 64 times on Facebook by the end of May. The language used by Vote Leave on social shows that they are trying to persuade their audience that they can ‘regain control’ by leveraging factors such as the NHS and the country’s finances. Loaded words such as ‘safer’ and ‘security’ show that they are trying to portray the EU as unstable and dangerous. Interestingly, they have also frequently championed Boris Johnson, despite many users on Twitter previously having a less than favourable opinion of him. This was not well received, however, with people accusing the Vote Leave campaign of making a mockery of a serious topic. THAT'T IT. I AM LEAVING. THE END. "Brexit and chill" ..? GOODBYE FOREVER. Bad. This is a classic case of a potentially great campaign concept not succeeding because it was aimed at the wrong audience. It shows the importance of doing your research into the personas of your audience on social, and not applying a ‘one size fits all’ approach to sensitive topics. A twist on this would probably have been better received by the ‘Stronger In’ campaign audience, who are a largely younger demographic. WATCH: The people of Europe urge YOU to #VoteLeave on Thursday to save democracy in Europe. This all looks very staged, and the responding tweets show that it reached people who had either already decided before they viewed, or users who strongly oppose the video, suggesting that it is not persuasive. Some also criticised the video for not touching on any of the important issues surrounding Europe, such as immigration. Ugly. Whilst video content is currently key for grabbing attention, the trick is to provide authentic value to the user once they have pressed play. They should feel that they are learning something from your content whilst watching, not like something has been set up simply to benefit your cause - otherwise they are not likely to finish viewing. The Vote Leave campaign tweeted a competition, offering users the chance to win £50 million to anyone who correctly predicts the results of each game of Euro 2016. Paddy Power described the odds of winning as ‘a billion to one’, however Vote Leave confirm in their terms and conditions that the prize money will go to the person who has the closest guess. Vote Leave state that the competition is open to anyone, regardless of how you plan to vote, and that it is simply to generate engagement with the referendum and make people aware of their claim that the UK spends £50 million a day on the EU. Good. Ok, hear me out. Although this is fairly tasteless, social competitions are a great way of attracting a lot of attention, fast, as everyone loves a freebie. Also, Vote Leave needn’t be too concerned about their target demographic, as it is so broad, and entrants who are of no value to the brand are usually the main pitfall of competitions. The offer of a £50 million prize irrespective of how one intends to vote, and to draw attention to the figure itself, positions the campaign as genuinely wanting people to be informed, and as giving something back. 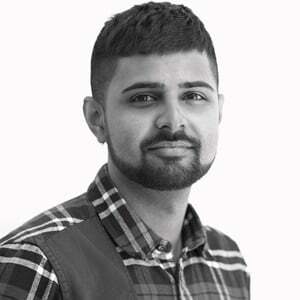 Twibbon is a service providing microsites that enable users to support your cause, brand or organisation on Facebook and Twitter in a variety of ways. The first mainstream use of avatars to raise public awareness on social was during the tragic Paris terror attack, when Facebook launched the tri-colour filter temporary profile picture. This received a mixed reception, however the ripple effect was undeniable, and would have caused anyone who was previously unaware to ask questions. 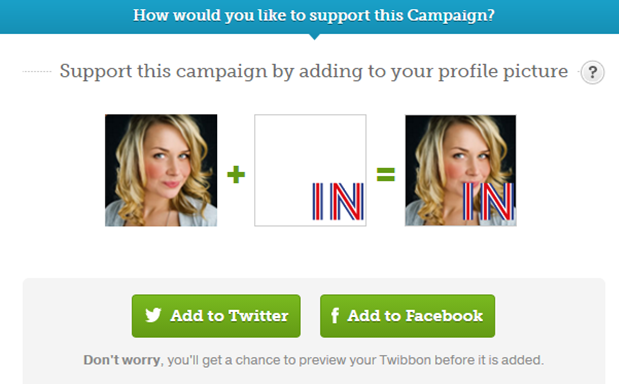 Both the Leave and Stay campaigns are now utilising custom avatars to raise awareness. 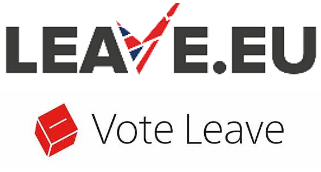 The ‘Vote Leave’ Twibbon doesn’t look as effective as the Stronger In version, due to the logo being less versatile, which is something to consider before launching a social campaign. Good. Contrary to what seems to be popular opinion, I think that custom avatars are a great way to raise awareness and show affinity to a cause or belief. 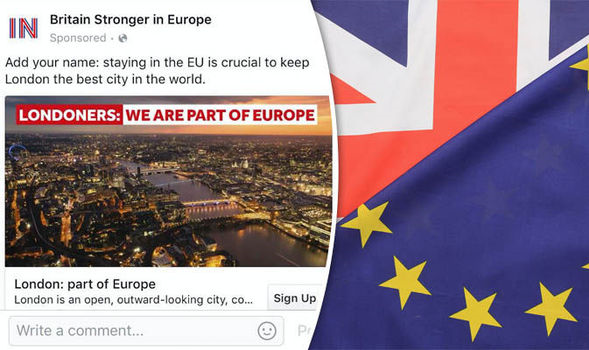 The Britain Stronger in Europe campaign was not nearly as active as the Vote Leave campaign in the run-up to the referendum, tweeting just 837 times and posting on Facebook 44 times by the end of May. Whereas the Vote Leave campaign landing page clearly displays their social share buttons, the Stronger In page doesn’t, which will have had some impact on their social following and engagement. The top words used by the Stronger In campaign are unsurprisingly very similar to Vote Leave, showing the challenges when it comes to sentiment analysis on social media. They have chosen to focus on jobs, as whilst everyone may have different feelings on issues such as the NHS, jobs are a universal primary concern for most people. This shows a good awareness of users whilst on social media platforms with the Stronger In campaign, as users are passively browsing – however by selecting an issue which is likely to affect them directly, you are most likely to capture attention. Stronger In have put a much stronger focus on their supporters than Vote Leave, which has received a better reception on social. On Facebook, they utilised the classic personalisation technique which was hugely successful for Coca-Cola, by positioning sign-ups as ‘add your name’. By choosing the capital city and targeting all users who live there, they immediately captured the attention of a huge cross-section of people and made the campaign directly relevant to them, which always grabs attention in the newsfeed. In the same vein, the content of Stronger In’s videos is also much more personal, as they include ‘real young people’ such as Jasmine sharing their opinions. This is much more likely to resonate with any audience than a set-up which looks staged. Good. In today’s age of Facebook, selfies and blogs, everyone is addicted to feeling important, so capitalise on this by putting your customer at the centre of your campaign. Whilst on social, users are usually chatting to friends and family, not considering life changing decisions or purchases, so make your product or service directly relatable to them to grab attention. Unless you have been hibernating in the build-up to Brexit and waiting for this all to blow over, you will have undoubtedly seen David Beckham’s pro-remain Instagram post doing the rounds. This is a prime example of the clout the correct ambassador can have when it comes to raising awareness for your campaign. Good. Beckham is an exceptional example as he is universally loved, however this success can be emulated on smaller scales by choosing ambassadors who are just as lorded by your target audience. People tend to be more influenced by other people than adverts, so pack a punch by getting a relevant influencer behind your campaign. Ugly. Campaign hashtags are not usually a bad idea, as they’re great for collating campaign content, make it easier for monitoring tools to gather information and encourage your audience to engage. However, this was a poorly judged attempt, as it isn’t clear what it means, and is patronising to the targeting audience - suggesting that they all need to be spoken to in slang to understand important issues. Understanding which platforms are most frequented by your audience, and coming up with innovative new ways to capture their attention there, is vital for the success of any brand on social. Stronger In have managed to establish a great presence on Instagram, perfect for targeting the younger demographic and encouraging them to vote – both with their own profile, and also with a little help from the Brexit and Chill project by art director Alex Seidl and copywriter Teresa Guggenberger. Good. Using the name ‘Brexit and Chill’, which failed to impress the ‘Vote Leave’ audience, and creating funny and original illustrations on Stronger In referendum musings has proved hugely popular on social. These images are now also being shared cross-platform on Facebook and Twitter, which is great for extra campaign awareness. Many would be surprised at the difference formatting social posts correctly can make. Social platforms have made it clear what they need to see from brand pages in order to provide value to their users, and by following their guidelines you can secure yourself a strong position in the newsfeed. This means that you then won’t have to pay through the nose for every post just to be seen by a decent percentage of your audience. The Stronger In campaign post frequent video content to boost their organic reach, and a large amount of link preview posts with a large thumbnail. Good. 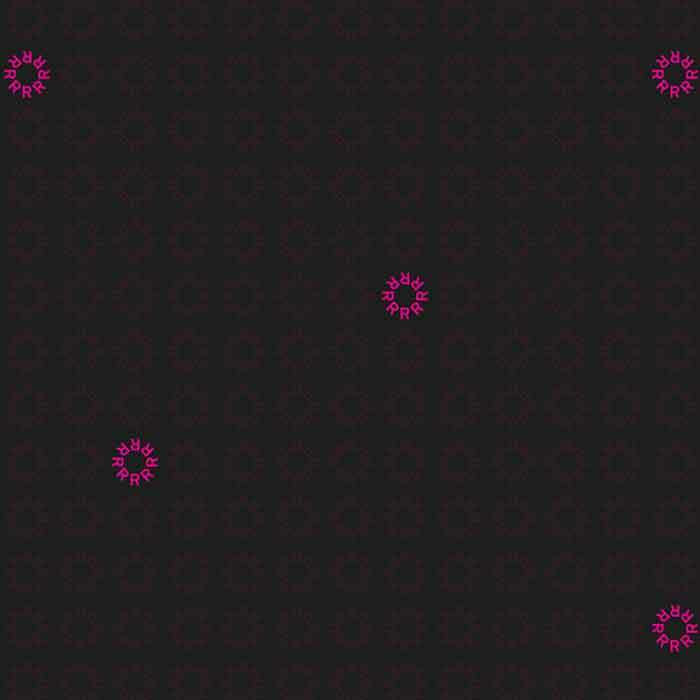 The large custom thumbnail captures attention in the newsfeed, and the description and content is informative, not just promotional. Linking to external sources also builds user trust, proving that your updates aren’t all just your own propaganda. User-Centred Marketing: Do your research. Know your audience. Design your social media campaigns accordingly. Personalisation: Relate your product or service back to your customers for higher interest and engagement. Geo Targeting: The more relevant you can make your campaign to users, the better it will be received. Ambassadors: Recommendation by a key influencer and exposure to their social audiences can be invaluable. Emotive Language: The reptilian brain's first priority is to avoid pain as a means of survival. If you can trigger this through emotive language and then suggest that your product or service can help to avoid this, you are more likely to persuade your audience. Content Format: Video, video, video. And don’t annoy Facebook. Contrived Content: Don’t be wooden. Make your content original, authentic and informative. Spamming: On social, less is often more. Try to get your message across as effectively as possible each time you post, eliminating the need for repetitive posts that spam the newsfeed. Wrong Tone: It’s vital to establish a strong, uniformed tone of voice that appeals to your audience on social and doesn’t offend them, or your message will be lost. If you made it this far, congratulations! If you need any help with the above or would like to discuss any of the points made, find me on Twitter on @ruby_mae. Thanks for reading!